Zack and Max have great adventures. Feel free to download and read the comic book series below. Ham Radio To The Rescue! Volume 7 of The Adventures of Zack and Max begin as they share with us what they learn about emergency preparedness and communication. Zack, Max and Mady, along with their family and friends, participate with their ham club in an emergency drill. At the drill they learn how to set up a station during an emergency, experience advances made in digital modes and help others in their community through amateur radio. Enjoy "Super Max" as he helps old and new friends get on air, and help others! 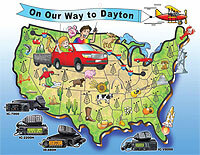 Dayton to Dayton, May '09 to May '10. You can still enjoy Zack and Max's wonderful adventures from last year's calendar. Download the calendar art work now! Volume 6 of The Adventures of Zack and Max takes us on a journey with HF amateur radio. Zack, Max and Mady, along with their family and friends, take a weekend road trip and have their own mini DXpedition. This means that they went to a nearby yet remote location (Orcas Island, one of Washington States San Juan Islands), and while camping tried to make as many world wide contacts as possible. They discover that HF is a way to contact the whole world, and that one does not need to spend a lot of money or go to the ends of the earth to have fun with ham radio DXing. Volume 5 of The Adventures of Zack and Max, Max in Space, explores new radio technologies, both digital and satellite. The writers are again the students from the Lake Washington Ham Club (KC7OIO) at Ben Franklin Elementary School in Kirkland, Washington. Under the leadership of Mr. Dave Condon (KI7YP), the students set out to learn about amateur radio in space, specifically digital radio, satellites, and satellite orbits. A local aerospace facility, Aerojet, invited the writers of our comic book to take a field trip and see first hand everything from propulsion systems for satellites to how radios are used in space to help position equipment. We would like to extend a special thanks to everyone at Aerojet who made this comic book possible. We would also like to thank our wonderful illustrator, Kayoko Nakajima, who used the young writers words and drawings to create another splendid piece. We hope that your whole family will enjoy Zack and Max's latest journey. Every year on the fourth full weekend of June, amateur radio operators throughout the Western Hemisphere (IARU Region 2) attempt to make as many radio contacts as possible using all forms of ham radio equipment. Once again, the students from the Lake Washington Ham Club, along with their leader Dave Condon, K17YP, wrote most of the story loosely based on their own clubs experiences during the 2005 Field Day exercise. Zack, Mady and Max discover the fun and challenges of camping out with radios as they participate with friends and family during Field Day! Have you ever had a close friend go on summer vacation, or worse yet, move thousands of miles away? Well the internet is not the only way of keeping in touch! See how Zack and Max keep in touch with Mady, as well as meet new friends when she goes to jolly ole England for the summer. In the third volume, Mr. Condons class returns to create another Amateur Radio Masterpiece as they were able to work with an incredible group of youngsters from The Priory L.S.S.T. School in Lincoln, England. Please download the latest edition as often as you like to share with family and friends. Enjoy! Thank you for your continued interest in The Adventures of Zack and Max Lost in Seattle. This story continues Zack and Max's adventures with their friend Maddy and a new cast of characters as they all begin another adventure. Max disappears! Zack, Maddy and friends learn about and use a variety of new technologies available for Ham's to save the day and find Max. Whether you're just starting out or an experienced Ham, you will enjoy this latest adventure and learn something new too!. And, if you do find it interesting and informative, please pass it on to a friend! Download this latest edition as often as you like to share with family and friends. Enjoy! Thank you for your interest in The Adventures of Zack and Max–The Odyssey Begins. This story is designed to provide you with some basic information about ham radio, giving a glimpse into its history, its applications, and its relevance in the world today. Whether you’re a student or an adult, this book tells a story about ham radio which we hope you will read again and again. And, if you do find it interesting and informative, please pass it on to a friend! Download as often as you want this coloring book version to share with family and friends. Enjoy! All call signs used in this story are real and are used with permission. 2002 Icom America Inc. All Rights Reserved. No part of this publication may be reproduced, transmitted, transcribed, or translated into any language, in any form or by any means, electronic, mechanical, optical, manual or otherwise for other than personal use, without the prior written consent of Icom America Inc. All characters are purely imaginary and any resemblance to any real person, living or dead, is entirely coincidental.